Provisional statistics from Transport for London show there was at least one collision every three days on the A23 in Streatham in 2017 - and, on average, every month one collision or more resulted in life-changing injuries. In total, on Streatham Hill and Streatham High Road between the South Circular and the boundary with Croydon, there were 133 collisions in the 12 months to December 2017; 14 of these were seious - resulting in life-changing injuries. Thankfully, for the second year running, there were no fatalities. The underlying trend, however, appears to be for increasing danger on the road in Streatham. Although this can’t be stated with certainty as, from September 2016 onwards, the police have used a new method of recording injuries and figures for serious and slight injuries are not directly comparable with previous years (severity of injuries is thought to have been under-recorded in the past). 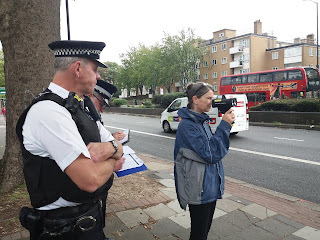 Green Party councillor Nicole Griffiths, who was out with the community roadwatch team of police recording speeds and issuing fines in Streatham this week, said: "More people are killed by vehicle collisions than by violent street crime yet these tragedies often go unreported. "I'm grateful to the police for highlighting the dangerous roads in Streatham and I'm going to be working with residents pressing TfL and the council to do much more to make our streets safer."